If you’ve done any research into hybrid vehicles or, more specifically, into the Toyota Prius, then you’ve probably come to the realization that the Prius family of vehicles includes much more than just the Toyota Prius. For instance, there’s also the 2018 Toyota Prius c in Edmonton AB. The Prius c offers many of the same things that the classic Prius does, but it is dedicated to a more niche market. Specifically, it’s geared towards urban drivers who are likely to spend just as much if not more time driving through the city than on the highway. The Prius c joined the Prius family back in 2011, and received a major update in 2015. This year, it underwent another update, refreshing some of its design cues like the front and rear fascias and lamp designs, as well as enhancing several aspects of the interior. In addition, safety received some much-needed upgrades, starting with making the backup camera standard across all models. While the Prius c isn’t quite as spacious as the larger classic Prius, it still offers 17.1 cu. ft. of space to fill with luggage or groceries or whatever it might be that you need to bring on the road with you. This is enhanced with either the Upgrade Package of Technology Package, each of which adds 60/40 split-folding rear seats for improved versatility. The Prius c Technology Package also adds a moonroof and other great features! 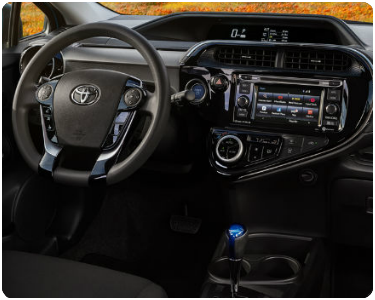 The 2018 Prius c is packed with great features like Touch Tracer Controls which displays a visual representation of the steering wheel-mounted controls so that you know you’re pressing the right button, and Choose Your Drive Mode which lets you optimize your vehicles output by easily selecting between three different drive modes. If you’re interested in finding out more about the 2018 Toyota Prius c, don’t hesitate to get in touch with us right here at the Toyota on the Trail sales desk. We look forward to hearing from you!